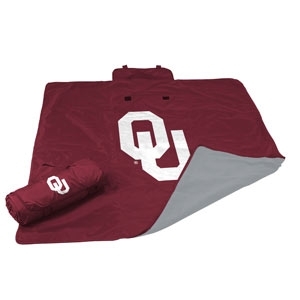 This University of Oklahoma Sooner All Weather Blanket is a perfect outdoor option for any season. With its water-resistant exterior, it can be used as a ground cover to keep dry or protect from the wind. The fleece underlining provides warmth and a soft seating area. Features a large logo complimented by a smaller logo on the roll up flap. Easily rolls up and secures with fasteners and carry handle for transportation.